Gooble Gooble! Until November 30th, Turkeys are back in the DFS Main Store! Visit the DFS Main Store! Time to plan that awesome family dinner or any special occasion will do! DFS Turkeys have a lifespan of 10 days and provide raw whole turkey. The DFS Turkeys are fully grown on Day 6 and will provide 1 meat with 5 uses before day 6 baby turkeys provide 1 meat with 1 use. 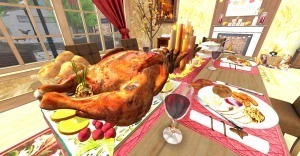 Female turkeys can get pregnant once after day 6.
https://www.digitalfarmsystem.com/wp-content/uploads/2016/10/dfs-logo.png 0 0 Fairy Catronis https://www.digitalfarmsystem.com/wp-content/uploads/2016/10/dfs-logo.png Fairy Catronis2018-11-12 07:12:202018-11-12 07:12:20Gooble Gooble! Until November 30th, Turkeys are back in the DFS Main Store! New DFS Flowers Are Here! Deck the Halls with Holiday Cheer!